It's that time of year again. One of the busiest shopping days of the year is almost upon us. 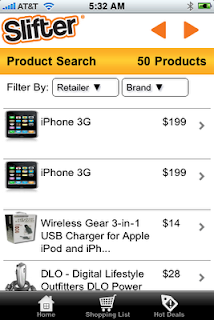 And, I just found an iPhone app that could make your shopping a LOT easier. Slifter is free in the Apple App Store. It uses your GPS to locate where you are. Then, you type in the product that you are looking for. It will give you a list of products to choose from. Click on the one you want and it will list where you can buy it and the prices. You can also filter by retailer and the brand. Recently, I bought a TV tuner for my PC on eBay. But, that was after I did some personal shopping with no luck. This app definitely would have saved me some drive time that I wasted. With this native app, you can also build your shopping list. It would be nice to attach some names to the items for a Christmas shopping list. And finally, there is a "Hot Deals" tab. Unfortunately, to get the most out of that function, you'll need to give up a phone number. You could also skip it but the app says you will lose some functionality. I can't wait to use this app for my Christmas shopping. I hope it will save me a lot of time and heartache. Hi Clay - I work for TheFind and we also have an iPhone shopping app called "TheFind: Where to Shop". I just demo'ed it as the ILM conference yesterday. Would love to hear your thoughts on it, as well, if you have a chance! Thanks - appreciate the review!